Coyote or fox?, originally uploaded by jahansell. This has been the subject of considerable debate tonight on Facebook so I throw it open to all of you! Coyote, or fox? I'm definitely not an expert, but it looks like a fox. Great photo! I'm pretty sure this is a coyote. 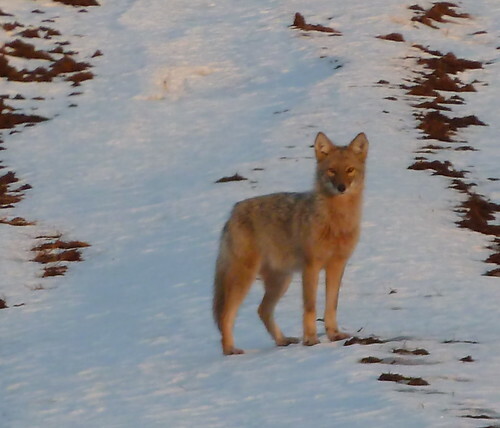 We have both at our house up on Sharon Mountain and a fox has much shorter legs in relation to an elongated body. Foxes also have quite distinctive coloring, either slate gray or dark chestnut red like a horse. Can't see the tail, which would help. Beautiful picture. I think HHH is right. Coyotes are taller than foxes. Great photo!